HUMBOLDT BAY – For weeks, Humboldt residents have gazed in helpless fascination at a riveting online reality show. The real-time video feed features a middle-aged couple making a family home – tending to their residence, preparing and eating food and raising two children. The stars are a Bald Eagle nesting pair which has, since 2006, raised 10 chicks at two nests on the property. 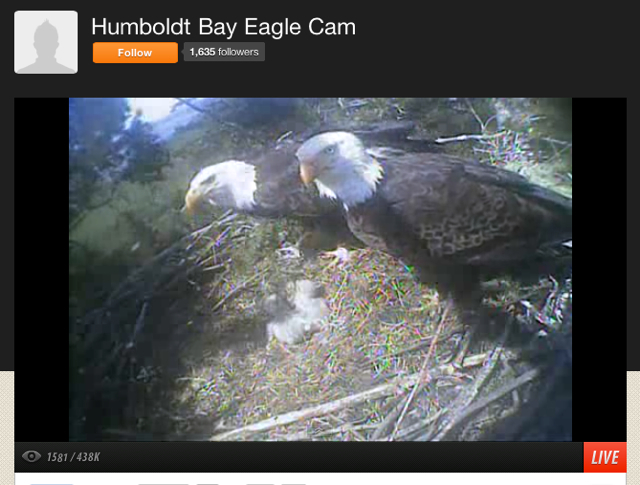 The Humboldt Bay Eagle Cam, a U-Stream feed available at ustream.tv/channel/humboldt-bay-eagle-cam, is sponsored by the Humboldt Wildlife Care Center (humwild.org/), using a grant from the Sequoia Park Zoo. Located on the property of a cooperating landowner, It streams a continuous video feed of life in an eagles’ nest near Humboldt Bay. Installed in December, the Eagle Cam has become a sensation since the female laid eggs and two little eaglets hatched last week. The Humboldt Bay Eagles Facebook page, facebook.com/groups/HumboldtBayEagles, offers a collection of photos and videos recorded from the UStream feed, including key moments of the eaglets’ hatching as well as up-to-date Q&A and gossip about the eagle family. At any given time, the site may boast 500 to several thousand viewers. A Saturday night story on NBC Nightly News tripled average viewership from several hundred to a few thousand. The Eagle Cam typically shows the mother sitting protectively over the newly hatched babies. Occasionally the father will appear with a fresh meal, which may be a fish, a mouse or a smaller bird such as a coot. Sometimes the mother will take advantage of the father’s presence to fly off for a spell. Both parents participate in feeding, tearing off bits of the current food item and gingerly offering them to the two “bobbleheads,” as the top-heavy chicks were initially referred to by Eagle Cam fans. The first hatchling, born last Wednesday, April 24, has been named Kyle after the landowner’s late nephew. The second baby, born a few days later, will be named by local schoolkids who participate in an essay competition (details on the Facebook page). Cam viewers maintain a steady dialogue in a chat stream shown alongside the view of the nest. A counter at lower left displays the current viewership and the total number of unique visits, which was at 428,000 by Monday morning. As images of the working couple’s nest construction, egg tending and eaglet-feeding lit up computer displays, the loss in local business productivity may have been offset by the long-term benefit to education. The Eagle Cam is being incorporated into curriculum in multiple classrooms and grade levels at Arcata Elementary School, according to Principal Margaret Flenner. She said students were doing bird studies and participating in the Godwit Days Student Bird Art contest. Fifth grader Sophia Murray will be honored for her winning entry at a May 10 reception. The Eagle Cam features the usual annoying advertising banners that sometimes obscure the action (“Should the GOP fight Obama on gun control?”) and is occasionally interrupted by blaring commercials for Burger King Cheddar-Bacon Stuffed Burgers and M&Ms. The camera was installed in collaboration with Dr. Peter Sharpe of the Institute for Wildlife Studies (IWS) and canopy ecologist Jim Campbell-Spickler, who works with Humboldt State University. Campbell-Spickler said he installed the camera in December, in anticipation of the springtime breeding season. Installation in the 120-foot Douglas fir was difficult, with driving rain and winds gusting to 40 mph. The tree is a snag, with the top 20 feet above the nest all rotten wood. He placed the camera at a “Dutch angle” to capture the entirety of the nest. “I was worried that they would build it out of the frame,” he said. Fortunately, the camera views the nest from the same direction as a hill that the eagles constantly monitor for predators, ensuring lots of face shots of the birds. Campbell-Spickler isn’t particularly happy with the audio. The microphone suffered water damage and has a noticeable electronic whine. It is stuck down into the side of the nest, which acts as a windscreen. The camera itself is just a small, lipstick-sized Sony security camera, the feed hard-wired to the residents’ home 500 feet away, and uplinked via their Internet. It was actually a disused spare that he pulled out of a parts drawer. Campbell-Spickler said he hopes to upgrade the entire apparatus this winter to possibly include higher resolution, pan-and-tilt capability and infra-red for after-dark viewing. Though busy with other eagle-related projects, Campbell-Spickler enjoys the visual fruits of his most popular installation so far, the Humboldt Bay Eagle Cam. “I’m just as fascinated as everyone else,” he said. This entry was posted on Friday, May 3rd, 2013 at 11:32 am	and is filed under News, Community, Animals, Environment. You can follow any responses to this entry through the RSS 2.0 feed.